But this guy’s life took a drastic turn when he found tested positive for HIV and learned that his time was limited. From that moment, a story unfolds about a man obsessed with finding a way to live a little longer, regardless of which laws may stand in his way. This character is completely brought into reality on the screen by none other than Matthew McConaughey. McConaughey physically transformed himself for this role, dropping weight to become a man we have never seen before. But a physical transformation is not enough, McConaughey brings out all his native twang and ups it a few notches to level “bull rider.” He’s the angriest of Texans who, at the same time, can bring out your empathy. And speaking of transformations, Jared Leto is amazing as an HIV positive transvestite who teaches Woodruff a little more each day about the life he must now live. The entire film is phenomenal, showcasing a time that seems so far away. Not many of us in our 30’s really remember how the 80’s reacted to the news of AIDS, and how communities were affected by it, how bigotry was the norm, how alien the whole thing seemed, how few resources were available, and this was only a few decades ago. And all the while, the film maintains heart, warmth, some pretty giant laughs, but prepare for a few heartbreaks on the way. This is a story that few Texans know about, but is one that is well worth hearing. From the overall theme of survival, to the critical view of the US regulatory framework. to the individual stories, the journey this film will take you through is quite an experience. 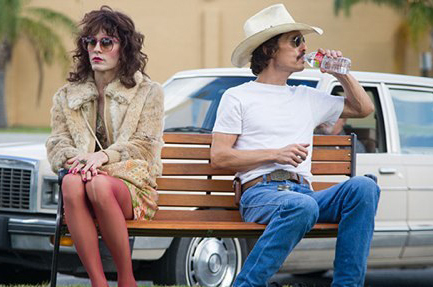 Film Review: ‘Dallas Buyers Club’!! This entry was posted on Friday, November 8th, 2013 at 11:15 am	and is filed under Film, News. You can follow any responses to this entry through the RSS 2.0 feed. You can skip to the end and leave a response. Pinging is currently not allowed. « Robert Rodriguez begins production on “FROM DUSK TILL DAWN: THE SERIES”!! !